In today’s gospel, Jesus taught His disciples how to pray. 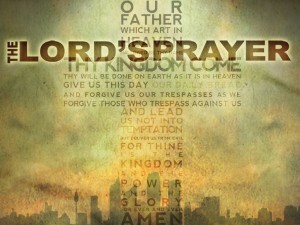 This is what we now call the Lord’s Prayer. This prayer contains seven petitions, all of them have a profound meaning. 1. Our Father who art in heaven: In addressing God as “our Father” we are acknowledging that every human person, including myself, is a child of God and therefore that we all belong to one huge family where we are all, in a very real way, brothers and sisters to each other. There is no room here for rejection, or hatred, or discrimination. 2. Hallowed be thy name: We are praying that God’s name be held in the deepest respect by people. 3. Thy Kingdom come: We pray that every person in our world may put themselves consciously and willingly under the kingship and lordship and the love of God. We do this, above all, by our working together to make this world the kind of place that God wants it to be. 4. Thy will be done, on earth as it is in heaven: We pray that we can fully want what He wants. We are only fully doing his will when we fully want what he wants, when our will and his will are in perfect harmony. 5. Give us this day our daily bread: We are only asking for what we need now, and now to worry about the future. We do not pray for just our immediate families, but all those who are in need. This reminds us to try our very best to help those who are in need. 6. Forgive us our trespasses, as we forgive those who trespass against us: Forgiveness in the Scripture always includes reconciliation between offender and offended. The true Christian has a rock solid sense of their own security and their own inner worth which no other person can take away. We ask for God’s grace to eventually reach this goal. 7. Lead us not into temptation, but deliver us from evil: In the end, we acknowledge our weaknesses and our total dependence on God’s help. We ask to be protected. The Lord’s Prayer are usually recited in a rapid way, but all petitions have a profound meaning. We should slow down and try to ponder over them.